Q:What is an Opinion of Value? A: Parts 1 and 2 of this four-part response outlining the methods of valuing commercial real estate examined the Direct Comparison method and the Cost Approach in order to create an Opinion of Value. 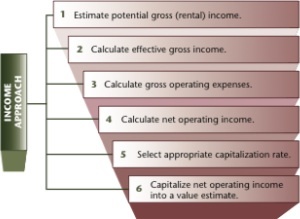 Another method employed to determine property value is the Income Approach. 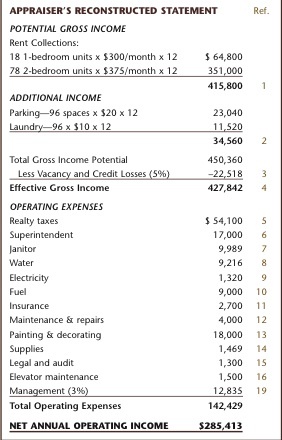 The Income Approach employs capitalization wherein the net income of a property is capitalized into a specific value. The two types of capitalization used in commercial real estate are Direct Capitalization, which is formulated from a one year income projection, and Yield Capitalization, which is derived through analysis that includes a more extended time period. Single year income and expense statements provide the basis for estimates forming Opinions of Value based on Direct Capitalization, whereas cash flow forecasts of several years are utilized in Yield Capitalization. This week, we examine Direct Capitalization. The capitalization rate, or cap rate, is one of the handiest tools in commercial real estate practices for comparing investment properties. Cap rates are assessed by calculating a property’s true net operating income (NOI) and dividing by the its fair market value. Properties with higher cap rates are generally more desirable investments. Let’s examine the six steps involved in the Income Approach. The most crucial element required for the six steps of the Income Approach is the reconstructed operating statement that reflects both income and expenses. For Direct Capitalization, a one-year analysis of a property owner’s income and expenses are calculated with all necessary adjustments based on comparable properties. Reconstructed operating statements are also employed to create an extended cash flow forecast for a period of several years. From the data in this example, we can determine a property’s net operating income and then divide that by its fair market value in order to assign a Cap Rate. Next week, we conclude our four-part Opinions of Value series by examining Yield Capitalization.